About a month after passing the 1,000,000,000th download, we released VLC 2.0.2 last nights. It’s now available on videolan.org. VLC 2.0.2 adds further refinements to the new Mac interface. We improved the video playback experience by enhancing the crop features and restoring the highly desired “go automatically to fullscreen” feature. 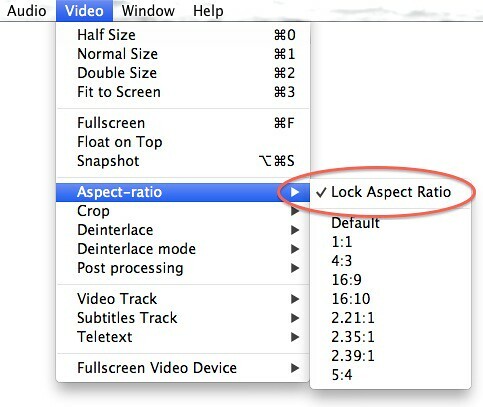 Additionally, the aspect ratio is respected like in the 1.1.x releases. 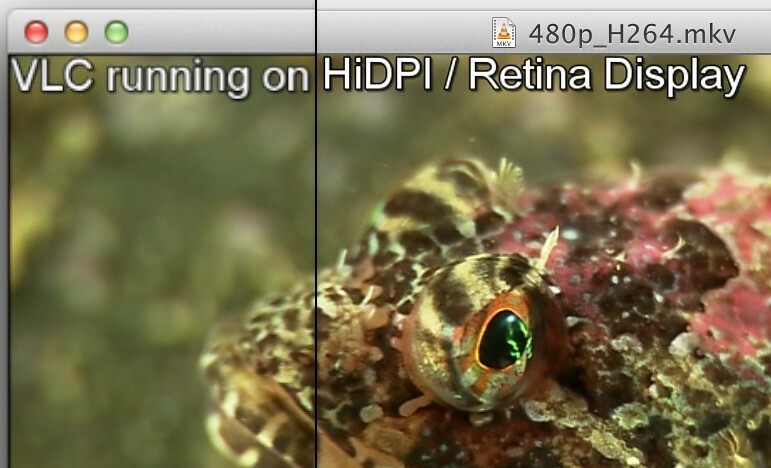 The Retina Display (HiDPI) on the new MacBook Pro is natively supported, too. Furthermore, you can drag & drop items between the playlist, services and media library. Growl 1.3 is supported for notifications as well (disabled by default). Playing a video in a window without any further UI elements is supported again, too. Finally, we removed the font cache. VLC for Mac will never ask you to wait for it, but it will still find all your fonts! This update also includes video output improvements for a vast number of PowerPC-based Macs equipped with an ATI Radeon 7500, an ATI Radeon 9200 or a NVIDIA GeForceFX 5200 Ultra  as well as Intel-based Macs with an Intel GMA 950 . Added media key support for keyboards by other manufacturers than Apple. This fix was facilitated through a hardware donation by ZF Friedrichshafen AG manufacturing keyboards under the brand “Cherry”. Since running the Mac OS X interface as an Extra Interface or Control Interface can lead to undefined results, the respective options will be automatically reset on the first launch, if needed. This fixes issues with unresponsive playback controls and crashes on quit. Updated Growl plugin supporting Growl 1.3. Improved reliablity in detecting VIDEO_TS folders when opened through the “Open Disc” panel. Re-implemented the “Window Decorations” option, which, if disabled, hides all the UI elements from the video output window to give you the cleanest experience possible. Improved the window title behavior when using the dark interface mode. It correctly responds to right and double-click events now. Fixed video output on PowerPC-based Macs equipped with an ATI Radeon 7500, an ATI Radeon 9200 or a NVIDIA GeForceFX 5200 Ultra. Fixed video output of 10bit encoded contents on Intel-based Macs equipped with an Intel GMA 950 chipset running OS X 10.6 or later. 1st and 2nd generation MacBook (MacBook1,1 and MacBook2,1), the Mid and Late 2006 iMacs (iMac4,2 and iMac5,2) and Mac minis sold between February 2006 and March 2009 (Macmini1,1 and Macmini2,1). Will there be official 64 bit version ? Coz downloadcrew site is showing VLC Media Player 2.0.2 (64-bit) . Of course, both for Windows and Mac OS X. However, the release isn’t live yet and we did some last minute fixes to the packages, so don’t trust the installers available from third parties. Thank You . Was just doubtful about it . Never had seen 64 bit VLC listed on any site . yeah, it’s pretty new. We started providing 64bit packages for Windows with VLC 2. Previously, 64bit was only supported on the Mac and obviously Linux/BSD. BTW i just downloaded a movie from torrent . It was a 700mb 720p movie . All such small sizes have lower volume audio . So I have to make the volume level at 200% but still couldn’t get a decent loudness . When I played the same file on KMPlayer & Duam Potplayer , it played ( the audio ) like any other normal video . The volume was louder and clear too ( in VLC at 200 % loudness increases ( not even close to KMPlayer or Potplayer ) but the quality degrades . Why is this happening ? How come those player can provide loud volume for same file and VLC cannot ? wow !! mentioning other players gets your comment deleted !! just wow !! no, I don’t delete comments referencing other players. To fight spam, I’m moderating every single comment, so you need to wait for it to appear. oww ok . sorry . BTW any official ETA for VLC 2.0.2 ? As soon as SourceForge.net fixes their broken mirror system. I just pushed the website update, so the downloads will be available within the next 10 minutes. Enjoy! Can you provide me with a link to the official Windows x64 VLC 2.0.2 Download? On videolan there’s only the x86-version and I don’t want to use Third-Party-Links!? @Robert: There might be a bug in 0.9.6 preventing the update. It is definitely fixed in 1.0 and later, but no idea about that dated release actually. Is it still experimental? I can find a x64 2.0.2 on the ftp (the experimental link still leads to 2.0.1 folder, btw). The “official installer package” just links to the x86 one. It’s confusing. @what? : I just fixed the link, thanks for the report. Regarding win64, well, that port is pretty new (introduced in 2.0.1). While we are not aware of any regressions, it isn’t tested enough to be considered as stable as the win32 variant. However, I can still recommend you to take it for every-day usage. Wow, thanks for the answers! @Flo: please read closely. This feature is Mac-only so far. Sorry about that. 1) It doesn’t remember “Repeat All” setting. This bug is forever? 2) Let me disable the playlist feature. Just opened a movie, watched it (maybe repeatedly) and closed. Please introduce the option to get rid of all this playlists mess. @Kim: for the playlist, please have a look at the lengthy posting on customization. It should answer your questions. For the repeat button, I’m not aware of any issue, but I can gladly investigate it! One of the things that went away many versions ago and has either never come back or has come back as an option somewhere where I can’t find it is the option to resize below a certain amount. There are times when I want to watch a video but I want it small in the corner, that isn’t really possible when I can’t get it below a certain size. I can’t remember it ever being a problem in the past but it just disappeared (5 versions ago maybe, but I can’t remember for sure). Is that a known issue, a known change, or some fluke? Is the removal of the font cache a Mac-only feature? @Jacob: there is an effective minimal playback window size on the Mac. We are aware of a proper solution, but it wasn’t implemented in time for this release. While we won’t be able to get entirely rid of this limitation, there will be a noticeable improvement. @venkat, Grayscale: The font cache is gone on Windows for a few releases already (1.1.something), so “cache-free” versions are available for at least 6 months. Just to precise my previous statement: the font cache was removed on Windows for the 1.1.11 release. Has this build got the Mac OS GPU Accelaration code in it from that demo build a few months back ? FYI, there is still no update for Win32 when I check via Help | Check for Updates… I’m on 2.0.1 right now. @Dave: no, it’s not. It’s going to be part of our next major release, version 2.1, since it requires deeper changes. @Alex: weird. Please post this on the Windows section on http://forum.videolan.org including information on your OS version. @Felix, thanks for the answer. I imagined that there was a minimum size but I figured that it was smaller than the currently enforced size on some media (which seems to be a percentage of the original size) because some media opens with a much smaller window size than others and a much smaller minimum window size. Hopefully this can make it into the next release though, it would be nice to be able to effectively be able to have the video in the corner while doing something else at the same time again. Felix, I have an older but not especially slow system (3.4GHz P4HT/Nvidia 7900GT/XP/DX90c) and so far all versions of VLC (both 1.x and 2.x. including this one) have an issue with CPU usage during playback when moving my USB mouse. In version 1.x I use the option to ignore wheel movements on the mouse, which entirely eliminates the problem, but that option doesn’t exist in 2.x as far as I’ve found, and deleting all hotkey references to the mouse doesn’t help. So CPU usage with any mouse movement quickly goes to near 100% and playback starts stuttering badly. The system has been virus checked etc. I’m using the latest CCCP pack (ffdshow/LAV/Haali/Matroska) but the problem existed before installation of any external (non-stock XP) codecs. One other issue, MP4’s created by VLC still appear to be wonky. They run at double speed the first second or so and indexes are either missing or corrupted. Jeff, thanks for the feedback. Regrettably, I’m the Mac-guy, so I can’t really help you on that matter. Please post it as detailed on http://forum.videolan.org in the Windows section. Thanks! How I can resize it normally? How to fix it? @Steve: please check this thread on our official forums: http://forum.videolan.org/viewtopic.php?f=12&t=102224 Thanks! PC user: VLC media player alerts me that 2.02 is ready and asks me if I want to download it, I click “yes’, but nothing happens. @Ed: just walt for a few moments for the download to start. This can take up to 10 secs. Of course, you can also just go to videolan.org and get the update over there. When will x64 version leave experimental stage ?